For me the journey began with a green couch, for Jill it began in an overstuffed green chair. I didn't quite know how to clean a microfiber couch and Jill didn't quite know how to clean up her act. I purchased some rubbing alcohol and began the task of revitalizing a piece of furniture, one that was soon becoming a total embarrassment. 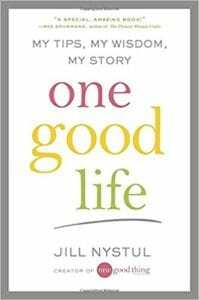 The blog I subscribed to, "One Good Thing by Jillie," was bright, encouraging, and full of life I needed to come into my own. During sleepless, fretful nights I would often hear a little ping from my iPad. It was one good thing coming from Jillie, who was finishing up her day in that green chair. I was clueless, remarkably so. Even though I had subscribed to Jill's blog I had no idea that she had been in the Ark, a rehab that was a "blend of tough-love boot camp and comforting nurture." Ignorance is bliss and I felt blessed as I followed her journey. The start of this combination memoir and I-want-to-help-you-fix-it book, began in a slow, tentative manner. It was as if Jill didn't quite know how, or perhaps was a bit anxious, to admit to the reader that she wasn't as infallible as she appeared to be. In fact, perhaps the most painful (yet helpful) thing her beloved father could have done was tell her she was little more that a drunk. It's easy to talk about the beginnings of love, the arrival of children. Joyous occasions are part of the fairy tale existence Jill wanted to have. Don't we all? In the latter part of the book I heard her remark there was no such thing as a fairy tale life, but I could have told her that. The exuberance of youthful experiences made me smile. Jill's conversational style of writing could have been expressed to me in a phone call or two, but it's her story and I won't repeat it. The angst of Kell's life-threatening illness found me biting my fingernails, but then the recipe for "homemade bath bombs for stressed moms" appeared. No great American novel here, but a great American tale, one that we've all heard before. Drunk. The madness had begun and the downward spiral was shocking. It was here, when Jill began to describe her descent into madness that she hit her stride. "There, it's out and they all know," it seemed to shout. The journey in that overstuffed green chair was a start to the recovery of one woman and her family. Jillie was "determined to sit down in that green chair each night and write something good at the end of the day." The book slowly began to come alive, as did Jillie, as the hints flowed and a life began anew. I always wanted to know how to unshrink my clothes and now I do. Quill says: A marvelous book and for me, a blessing in disguise.